You can do many of the same things with Facebook Pages that you can do with friends — write on their Timelines, tag them in status updates, and so on. The main difference is that instead of friending Pages, you like them (thus, instead of becoming a friend, you become a fan of a Page). When you like a Page, your information and access to your Timeline isn’t shared with the Page and its admins, although any posts you make to a Page are public. Profile picture and cover photo: Just like you and your friends, Pages use one photo to represent them across the site. Usually, it’s a logo or an official press photo. 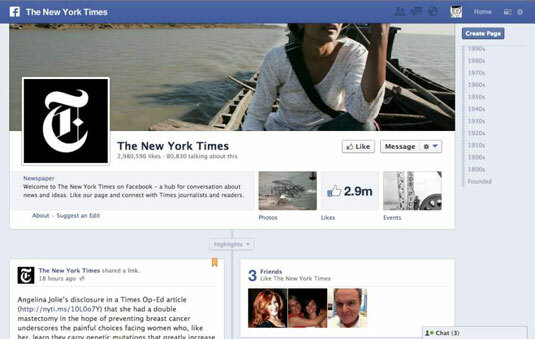 Pages also have a cover photo, often an image that more broadly represents the organization’s brand. Like button: The Like button is located at the right of the Page’s name. To become a fan, click this button. Message button: Click the Message button to say something directly (and more privately) to the admins of the Page you’re looking at. Options: Clicking the gear icon opens a drop-down menu from which you can report, share, unlike, or send feedback about a Page. About, Photos, Likes, Events: Below the cover photo is a bit of basic information and links to see more content — photos the Page has added, other Pages it likes, and events it’s promoting. Timeline (and Share box): The Timeline is the heart of a Page — it’s where the admins post updates and fans can leave posts and comments. Pages may or may not have a Share box here, although most choose to let their fans interact as though they were friends. Scroll down to see posts the Page has added, as well as information about interactions between your friends and the Page. Community Pages, or Pages that don’t officially represent something or someone, tend to cover a wider range of things, from basic activities to political statements. Often, the object represented by these pages is something that simply can’t be owned by a corporation or individual — things like “Cheese” or “Ultimate Frisbee” or Pride and Prejudice. Topic Pages don’t have a Timeline. Instead, they show you a list of your friends who also like that topic and related topics as well as any relevant content about your friends and that topic. Topic Pages pull basic info from sites like Wikipedia to explain what they represent. Topic Pages function mostly as badges on your Timeline, appearing in your Interest boxes. The layout of Community Pages, on the other hand, is identical to that of Official Pages. These Pages tend to be more specific than their Topic counterparts, but the admins are not official representatives. You’ll know you’re looking at a Community Page if you see the word “Community” labeled directly below the cover photo. Wherever you go on Facebook, and in many places across the entire Internet, you’ll see links and buttons prompting you to like something. You can like photos, statuses, comments, articles, websites, videos… if it’s online, you can probably like it. Gives you a News Feed subscription. After you like a page, you may start seeing its posts in your News Feed. If you don’t like what you’re seeing, you can remove that Page from your News Feed. To do so, go to the Page and hover over the Like button; from the drop-down menu, click Show in News Feed to uncheck it. Provides access to the Timeline. Just as when you add a friend, liking a Page lets you post on its Timeline, usually with the capability to add photos, links, and videos. Not all Pages allow fans to post on their Timeline, but many do. 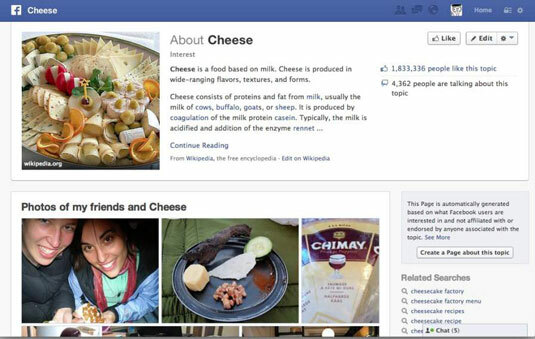 Displays the Page you liked on your own Timeline. Keep in mind that when you like a Page, it appears in the Recent Activity section of your Timeline, and by default, this section is visible to Public/Everyone. So what does this all mean for you? Basically, when you like something, you’re starting a relationship with it that can be as interactive or as hands-off as you want. Frequently, people like a lot of Pages simply as a signifier or badge on their Timelines. However, just because you like Modern Family doesn’t mean you want to read episode recaps or watch interviews with the cast. And that’s fine. On the other hand, if you like seeing those sorts of things, or interacting with other fans on the show’s Page, you can do that as well. It’s a pretty flexible system.